In 2011, a catastrophic drought struck the Horn of Africa, affecting Somalia, Eritrea, Ethiopia, Djibouti and Kenya. Over 12 million people were in immediate need of food aid. In the first year of our response, CARE reached some 2.8 million people in the worst-affected countries – Djibouti, Ethiopia, Kenya and Somalia – with crucial assistance including food, safe water, sanitation, health, education, livelihood assistance and protection for the most vulnerable people, including survivors of gender-based violence. In addition to immediate relief, we support a number of long-term responses to the reality of recurrent drought – including innovative livelihood approaches to help vulnerable people earn a living in ways less dependent on the unpredictable rainfall. This included distributing food supplies, including staples targeted at pregnant women, nursing mothers, children and other vulnerable people; emergency treatment for child malnutrition, including inpatient and outpatient support, supplementary feeding programmes, and distribution of Plumpy’nut, a fortified peanut-based paste used as a frontline treatment for severe acute malnutrition. This included water trucking, construction and rehabilitation of latrines, boreholes, water pans, hand-washing stands, livestock water points and water storage tanks; hygiene promotion and training; distribution of water purification tabs; distribution of soap and water jerry cans. This included distribution of seeds, agricultural inputs like fertiliser, provision of small farm animals like goats, sheep and chickens, veterinary services and training for pastoralist communities, targeted reduction of herd sizes with compensation to owners, cash for work, unconditional cash transfers, and monthly distribution of food vouchers. This project saved my life and that of my family. As soon as I received the cash, I bought essential food for my family, and some basic clothes for my children. Imagine when you are in a severe drought and you have no source of income and have to care for a large family and number of young children. Since 2012, several successive seasons of average or above average rainfall and low food prices, along with a sustained humanitarian response, have considerably reduced the number of people suffering from hunger. However, despite these improvements in food security, acute malnutrition rates remain very high, especially in the south of Somalia: during the second half of 2013, an estimated 258,000 people died in Somalia from hunger and related causes, and half of them were children younger than 5 years old. Long-term solutions to break the hunger cycle are crucial. CARE continues to work in Somalia, Ethiopia and Kenya to meet immediate needs and help communities become more resilient for the future. 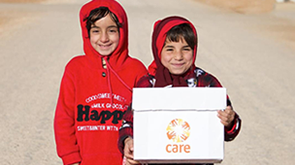 CARE is also continuing to provide aid to more than 400,000 refugees in Dadaab, Kenya, the largest refugee camp in the world, where many Somalis who have fled conflict or famine are now living. CARE is the primary provider of basic services in Dadaab, including food, water and sanitation, and runs long-term employment and education programmes to promote self-sufficiency.